Daria Gavrilova celebrates her first-round win over Irina Falconi. 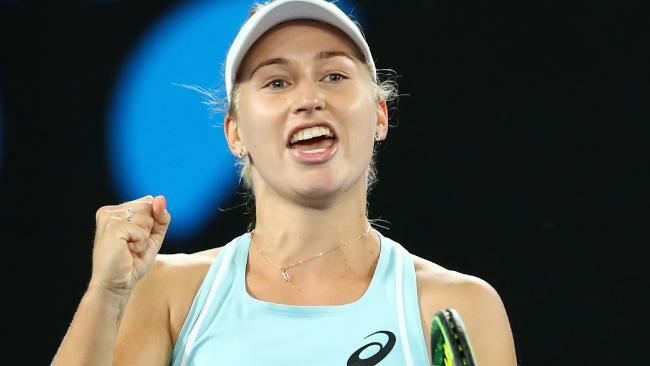 WHERE there were some nerves from some other notable Aussies before her on Day 1, Daria Gavrilova had no such hometown stage fright on the Australian Open's opening night. 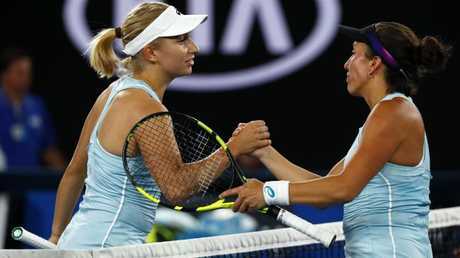 Taking centre stage on Rod Laver Arena, 23rd seed Gavrilova charged into the second round with a commanding 6-1 6-1 victory against American Irina Falconi. Falconi had won the pair's only other previous meeting, in 2015, but the qualifier - ranked No.131 - was never in the hunt, with Gavrilova winning the last five games of the first set before taking control with the first three games of the second. The comfortable 64-minute victory was the perfect tune-up for what looms as a potentially tricky second-round match with Belgian world No.37 Elise Mertens, a two-time tour winner who only narrowly missed being seeded here. Mertens had a similarly dominant display against another qualifier, Viktoria Kuzmova, winning 6-2 6-1. German 12th seed Julia Goerges also looms in the third round. "I'm really happy with the way I played today," Gavrilova said. "I'm not putting expectations on myself and no one in my team does, all I do is just go out and fight every point." Despite putting in just 22 of her 40 first serves, Gavrilova was broken just twice throughout the match, returning fire with seven breaks of her own. And in hitting 23 winners to five, it was clear Gavrilova was the more willing of the two to push the issue. Mertens defeated Gavrilova in three sets at the Hopman Cup earlier in January and also knocked the Aussie out of last year's French Open in the first round, also in three sets. Daria Gavrilova celebrates her win over Irina Falconi. The Aussie No.2 said she knows full well she is in for a tough encounter on Wednesday. "I've been watching her at the Hopman Cup, she's been playing really well," Gavrilova said. "I think she's pretty confident. She defended her title in Hobart, so it's definitely going to be a tough match. "I don't think there is a clear favourite to win this match." But as for her performance against Falconi, Gavrilova said: "I'm really happy". "First rounds are always nerve-racking, but I think I handled myself really well tonight."